Shimano's heavy-duty Torium Baitcast Reels are geared for maximum speed and efficiency. Each Torium Reel incorporates a tough one-piece die-cast aluminum frame, connected to a sturdy all-aluminum right side-plate and a lightweight graphite left side-plate with aluminum brace. Shimano’s innovative High Efficiency Gearing (HEG) ensures quick retrieves with no loss of power, matching 3 ARB corrosion-resistant ball bearings with a Super Stopper anti-reverse roller bearing. Oversized clicker and cast control knob; non-slip Septon ergonomic handle with adjustable shank for extra torque when you need it. 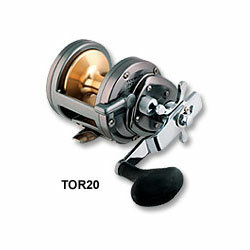 "I have the tor16 it is great for albcore and thresher sharks, i use it for trolling it works great, and I have used this reel for over sized sturgeon fishing it stops those big sturgeon in there tracks and this reel is bye far the best reel for the money, this reel with shimano rods can't go wrong"
"Ive thrown alot of reels and this one cast like a dream. Smooth and quiet"